Go green in your kitchen and get healthy with OrGreenic Kitchenware. It is the non-stick cookware that is made with natural ceramic. This 9″ frying pan with a super non-stick surface has a patented natural ceramic material that requires little or no oil, butter or grease to cook. Stuck foods will be a thing of the past. Also the non-toxic ceramic coating on the OrGreenic won’t ever chip or peel away. With other non-stick pans, the surface may chip, flake and wear off into your food as you’re cooking. Then when you and family eat that food, you will be ingesting toxins. But with OrGreenic you get a safe and a preferable way to a healthy cooking lifestyle. Plus the handles are designed to stay cool for convenient cooking. 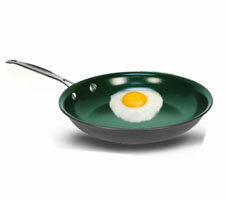 You can order the OrGreenic 9″ Frying Pan for just $19.99 plus the cost of shipping and handling. But wait there’s more. As a special bonus, you’ll also get a handy Food Chopper and a Fast and Easy cookbook free with your order. You just have to pay the additional shipping cost. Do you have other pots and pans on the market such as this and if so where can I go on the internet to look at them for pricing, etc…. Is there a pan bigger such as 13″ available? Besides the regular skillet, is there a square griddle skillet available?